We are a few days into the meteorological autumn and the signs are apparent. Winter migration has started for the birds and many are on their way to their wintering habitats in warmer climates; others have come from their breeding grounds in Scandinavia and the Arctic to spend the winter in the milder climates of central Europe. Flocks of redshank feeding on the mudflats, joined by black-tailed godwits, dunlin and water fowl such as teal are now a common sight on the Halton saltmarshes. 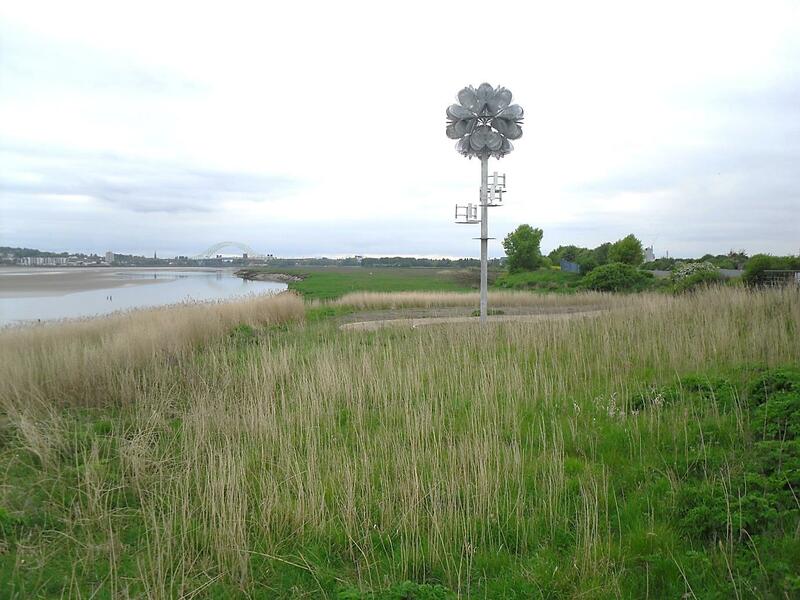 A good viewing platform to watch birds feeding on the mudflats at low tide is located on the Trans Pennine Trail, next to the future flower installation at Widnes Warth. From here you have great views over the estuary and of the Mersey Gateway and Silver Jubilee Bridges. Future Flower installation on Widnes Warth. Other autumnal indicators we can see are the ripe fruit and berries hanging heavy on the trees and bushes. For example, rosehips, the fruit of the rose bush, as well as blackberries (crumble, anyone?) and elderberries (great for jellies or jams), make a good indicator for the approaching winter providing much needed food for animals. 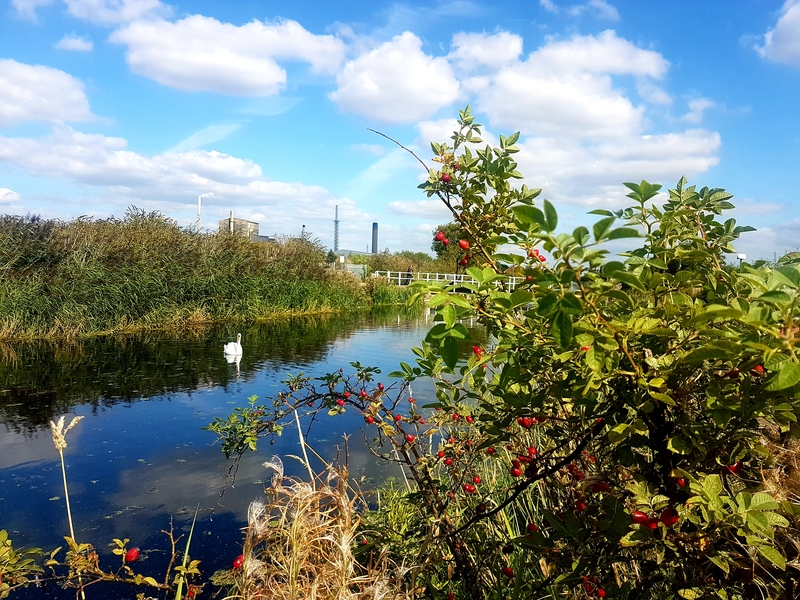 St Helens Canal in autumn. It is crucial for wildlife to be prepared for winter – food and shelter are essential for their survival. What can you do to help? Don’t tidy the garden too much and leave a pile of leaves and twigs for animals to hide and shelter in. And although many garden birds are enjoying the fruits and berries, it is now time to prepare the bird feeder for winter. With the lower temperatures fat balls mixed with seeds are a welcome energy food. But remember always to remove the nylon mesh – birds can easily trap their claws in the mesh, risking injury and trapping. An alternative option is to make your own, using seeds or mealworms as fillers to add protein and carbohydrates. If you don’t have a garden, don’t worry, just enjoy the season from your window, go for a walk at Wigg Island or join a guided tour around Spike Island (see http://www.merseygateway.co.uk/2018/08/new-environmental-information-and-guided-walks-at-mersey-gateway-visitor-centre-in-widnes/). Let us at the MGET know how what you are up to this season by tweeting us (@mgenvtrust) or sending us a message on Facebook.